Secondly, I’m participating in The Refashioners again! In case you missed last time The Refashioners is the brainchild of the lovely Miss P (who is a thrifting and restyling queen!) who picks out a surprise garment from a charity shop and mails it to participating bloggers who then take the thrifted find and turn it into something amazing and wearable with our seamstressing skills and/or magic. This year are some returning favorites and some new additions! I can’t wait to discover what comes in the mail and see what everyone else makes. Look for the finished projects begining in June. I’m planning a trip to NYC! Around Memorial Day in May. If anyone living around there or passing through wants to get together for a little meet-up, be it fabric shopping, FIT museum viewing or just lunching, let me know in the comments or shoot me an email (dixiedavis at gmail dot com). I’m seriously open to getting to know anyone and everyone I can while I’m up there! Also I know it might be tough ’cause people have jobs and all but most likely I’ll be there on weekdays rather than the weekend. Maybe a little afternoon/evening dinner and a Mood visit? So I’ve decided to start opening more sponsor spots on my blog. Because… well, why the heck not. 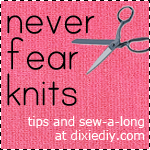 If you’re a sewing minded business or blog looking to get your name out there check out the sponsor page for details. Then there’s this… I’ve felt compelled to talk about this random pattern for awhile but didn’t want to dedicate a whole post about what is sure to be a rant but look at this thing! Ok, I can maybe understand a chair cover and an apron with your favorite team’s logo but a keg cozy!? A cooler cover? And worst of all is the BEER BANDOLIER. You know, if you want to be Pancho Villa at the Cowboys game or something. How much beer do you really need to carry on your person!? If you’re wearing that wouldn’t all the beer get warm by the time you drink it? Even if you’re using it to pass beer to all your buddies in the parking lot wouldn’t the beer get hot just chillin’ on your chest like that? Who wants a luke warm Pabst?? Plus, what if you want to sit down on your fleece covered fold out chair? Wouldn’t beer cans all down your back be really uncomfortable as you are sitting? Sewing Indie Month Pattern Bundle and the Refashioners! Previous Article← Shopping bags – for the environment! !